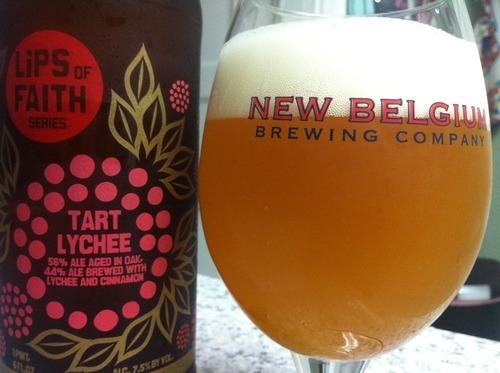 New Belgium Tart Lychee | Drink. Blog. Repeat. I’ve talked before about how New Belgium’s Lips of Faith series is what makes the brewery really stand out. While Fat Tire is a great gateway beer, the unique and inventive brews they concoct through Lips of Faith are generally stellar, and – as the name entails – a bit of a leap (or lip) of faith when it comes to trying something new. I had heard rave reviews fo Tart Lychee, a twist on a sour ale with part of the batch brewed with cinnamon and the other brewed with the lychee fruit and aged in oak barrels. Lychee is a sweet but tart tropical berry that imparts a smacking flavor but not too overly sour for the slightly developed palate. After trying it a few times, it’s lived up to all the hype. It pours a hazy opaque lighter orange with yellow around the sides. It’s topped with two fingers of tight a white head that settles quickly. For a 6% beer, there was some surprisingly strong lacing. On the nose are these amazing sweet and tart fruit notes. Big hints of grapes, star fruit, muscadine and a slight hint of the oak. There’s a very strong tartness also present but with the coating of those tropical fruit notes. On first taste, there’s a strong tart bite on tip of the tongue. A luscious juicy fruit flavor floods through the mouth after that. Coats. There’s that bit sourness on the back of the tongue that blooms into this tart but sweet fruit taste, which I guess is from the lychee. The cinnamon is strongly noticeable, and there’s definitely a kind of musk from the oak. I can see Tart Lychee being a bit of a hurdle for a lot of people. The oak and the tart fruits are a bit of a contrast, but after your palate settles a bit, they blend together in a surprisingly great way. Pingback: New Belgium/Alpine Beer Company Super India Pale Ale | Drink. Blog. Repeat.